Rossi Ernesto [27.03.1827, Livorno — 4.06.1896, Pescara] was one of the most prominent Italian Shakespearean actors of 19th century. He came from a middle class family and was intending to study at the university in Livorno. His career as a performer started when he substituted for a diseased actor in the Calloud theatre company. His very first stage performance was given with overwhelming success. He decided to keep on performing with the company until its dissolvement in 1848. He joined the Reale Sarda theatre company in 1852 and soon became its first actor. He began to go on tour in Italy and France (Paris) alone with a famed Italian tragedienne Adelaide Ristori, but their personal clashes led to the break up of their theatrical collaboration. Rossi frequently was on tour throughout Europe, he was giving performances in London, Vienna, Lisbon, Moscow and even in the South America (Brazil). 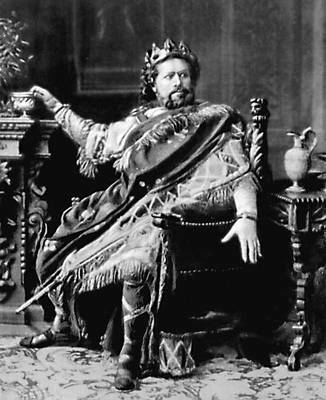 Rossi gained popularity, particularly for his interpretation of Shakespearean roles as Hamlet, Macbeth, King Lear and Romeo. As a dramatist Rossi wrote several plays. In the first one, Adele, Adelaide Ristori played in the leading role. Russia played quite a significant role in Rossi’s life since he performed there on more than one occasion (in 1877, 1878, 1890, 1895, 1896). His stage art earned high praises from Russian theatrical reviewers and intelligentsia. “When I was young I saw a prominent at that date all over the world Ernesto Rossi in Hamlet and during the entracte I was allowed to look in his dressing room: he was reclining in the arm-chair with his breast naked and was as white as canvas with huge dews of sweat at every pore...” (Bunin, I. A. Avtointerviu // Nauka i zhizn’. No. 6. 1976. — translated by the authors). In May 1896 he was playing a part of King Lear in Odessa when he came over ill and was brought back to his motherland where he crossed the Styx a few weeks later in Pescara.